Mention the Blackheath caves and most people won't know what you're talking about. Locals may remember the mysterious crater of April 2002, but there are proper caves in Blackheath, and have been since at least 1677. In 1780, a local builder discovered an entrance to the three caverns, and seeing an opportunity, built a cottage around it to claim the land. He built 40 steps down, and began to charge sixpence for curious Georgians to enter Jack Cade's Caverns — named in honour of a man who assembled a small army on Blackheath in 1450 to revolt against the corrupt power of King Henry VI. Toxic fumes were a hazard in the caverns and 19-year-old Lucy Talbot fainted and later died because of this. The proprietors installed a ventilation system, consisting of a shaft and a pair of bellows, and the underground curiosity soon became a hotspot for parties and debauchery. A bar was installed, and a chandelier apparently hung from the roof, making the caverns the go-to place for balls, alcohol and, by some accounts, naked women. The raucousness came to the attention of the authorities who closed up the caverns in 1853 (newspaper reports vary between 1852 and 1854). Several unsuccessful attempts were later made by the local council to reopen the caverns, and at the start of the second world war, they were considered as an option for an air raid shelter. When the council went to assess their suitability, they found Victorian graffiti, wine bottles, and other remnants of its hedonistic history. The caverns had the potential to house hundreds of people, but were deemed structurally unsound, and were closed again. The most likely explanation for the appearance of the caves is chalk mining. In 1677, William Steers was fined £40 for mining underneath Blackheath Hill and causing wagons to overturn. Blackheath is rich in chalk and there are accounts of other chalk mines in the area. It has been suggested (for instance in Jo Swinnerton's London Pocket Companion) that the caverns were created as early as the 5th century, as a safe space to hide from the Saxons, and later Danish invaders, following the withdrawal of the Romans. 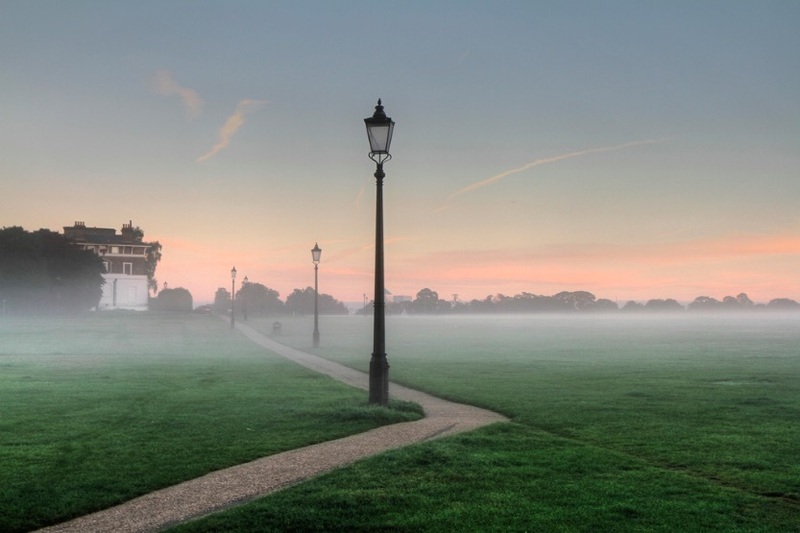 The cavern is north west of the Heath and south west of Greenwich Park. Different accounts locate it in different places; the extreme end of the back garden of No.69 Maidenstone Hill; the end of Cavern Cottages; Hollymount Close; and the back of Trinity Church, which was demolished in 1951. The row of Cavern Cottages ended at Trinity Church (where Cade Tyler House now stands), a site less than 0.2 miles from Hollymount Close. Both are on Blackheath Hill, metres from the 2002 sinkhole. 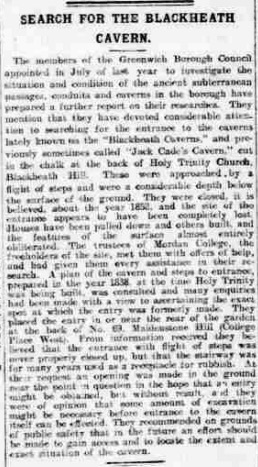 One man claims to have found the entrance in the garden of a terraced house on Blackheath Hill — 40ft deep, sealed with sand and covered with railway sleepers. Several reports give its location as 77 Maidenstone Hill, which is between the lawn of Hollymount Close and Cade Tyler House, and after some research, we reckon that this is most likely location. As far as we know, it's impossible to get into the Blackheath Caverns, but if you know differently, let us know in the comments below. In the mean time, why not satisfy your subterranean curiosity with a trip to Chislehurst Caves? Newspaper cuttings courtesy of British Newspaper Archive.